truSpring exGrow has the power of 0pH acid but is certified 100% safe for people, pets, plants, and the planet. Only harsh sulfuric acid is comparable, which has always been used in agriculture, but which is dangerous for you and would kill your plants if exposed directly. GOOD FOR EARTH. GOOD FOR EARTHLINGS. Combat the constant buildup of mineral salts with monthly applications during your growing season. Each 32oz bottle treats about 16,000 sqft or the average size yard (5,000sf) 3 times. You should see improvement in color and/or coverage within 2-4 applications over 1-2 months. Can exiGrow help my soil? Have a yard like a soccer field or Versailles? GOT CLAY OR SANDY SOIL? All healthy soil should be composed of about 5% organic material. Humic Organic Pellets (HOP) is the best and easiest way to increase essential microorganisms in your soil. And if you have clay or sandy soil, HOP is especially beneficial for increasing retention in sand and absorption in clay. Apply after an application of exiGrow to help it penetrate your soil. NEED A SPRAYER TO APPLY TRUSPRING GROW? Use this Ortho brand hose-end sprayer that allows you to set the dosage and doesn’t require mixing. Great for all your lawn and garden products and washing the dog, car, etc. A soil meter will help you see how truSpring Grow is helping to reduce mineral salt blockage, manage pH (grass generally grows best at 6.5pH), and increase water penetration. This light-weight, heavy-duty hose expands from 17’ to 50’ and makes applying lawn and garden products, washing the car, etc. super easy. 100% guaranteed. exiGrow breaks up hardened minerals and softens clay that block water, air, and nutrients essential for strong, healthy roots. Avoid the expense and hassle of mechanical aeration, which is messy, damages roots, doesn't solubilize essential minerals, or improve soil pH. Commercial clients report reducing water use up to 40% and fertilizer use up to 70% since more of both get absorbed into the soil rather than running down the gutter. for plants, pets, people, and the planet. All-natural ingredients: 27% Palm Methyl Esters, 5% Coconut Oil Fatty Acids, and 68% inert ingredients. ExiGrow contains the proprietary active ingredient Syntech, a patented acid replacement technology that has the power of 0pH but is 100% safe. Just spray on your lawn and garden each month during your growing season by using a standard hose-end sprayer. Same patented advanced technology used by professional groundskeepers since 2006. How do I apply exiGrow? Pour exiGrow super concentrate into a hose-end sprayer with a variable dosage dial (similar to the Ortho Dial ‘N Spray). Lightly spray on troubled lawn and gardens (each ounce of concentrate should treat up to 500 sqft). Avoid applying during the hot time of day. Immediately apply just water for about 1 minute - long enough to soak the solution in but not dilute potency. Do two applications in consecutive weeks in the first month followed by monthly applications during your growing season (when you’re still watering). No! ExiGrow replaces and enhances aeration. No more hours pushing a gigantic machine under the hot sun. Simply attach exiGrow to your hose and spray! How long has exiGrow been used for soil treatment? Professional groundskeepers for PGA-level golf courses and major sports stadiums have been using the exiGrow solution since 2006 (our commercial version is called Eximo). In fact, the PGA-owned golf, Valhalla Golf Club, uses and recommends it in its groundskeeper training program. Will I still need to water and add fertilizer to my lawn? Not as much or as often! ExiGrow allows all the nutrients your grass needs to get down to the roots, maximizing the effects of water and fertilizer. The patented all-natural solution is free of harmful chemicals, is 100% biodegradable in 10 days, and is certified safe for people, pets, the planet, and, of course, your plants by Cleangredients, Green Circle, and has an HMIS (Hazardous Material Identification System) rating of triple 0 (no hazard). If I use my own sprayer, what dosage setting do I use? You can pour exiGrow into any standard lawn and garden sprayer with adjustable dosage and set the dosage to 1oz per gallon depending on the condition of your soil. If you’re using a tank sprayer, you can pre-mix the concentrate in the tank at the dosage of 150:1. Is exiGrow safe for my food gardens? exiGrow is definitely safe for your lawn and food gardens. The ingredients are 27% Palm Methyl Esters, 5% Coconut Oil Fatty Acids, and 68% inert ingredients, which includes our patented technology we call Terranex. It is certified HMIS triple 0--no danger to health, flammability, or physical contact--and is 100% biodegradable within 10 days. Farmers have been using our solution for many years. 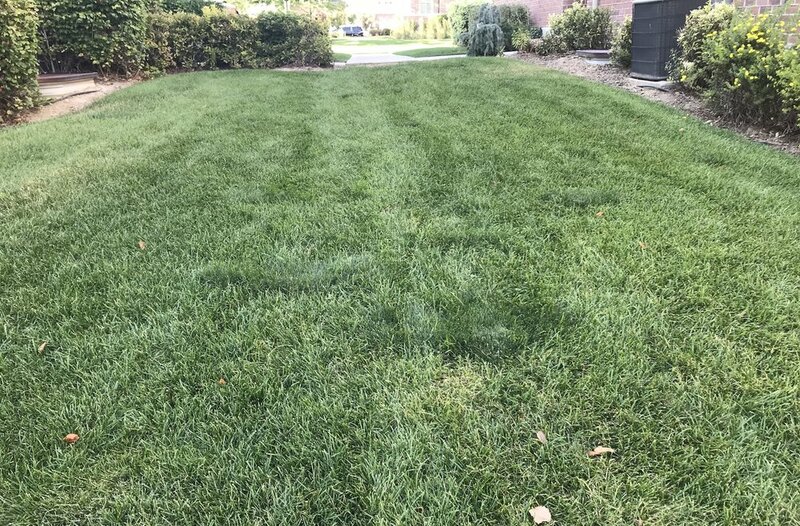 Is ExiGrow safe to use on St. Augustine grass? Also, can I still use a weed control product when necessary? exiGrow is completely safe to use on all types of plants. You should continue to use weed control and fertilizers as usual; however, exiGrow will boost the benefit of fertilizers up to 70% and cut water usage up to 40% because of the more porous soil. Have any third-party studies been performed? The main active ingredient called Syntech is a patented natural acid replacement. The chemistry of how this loosens your soil is pretty basic. Hardened alkaline mineral salts compact your soil and block the water, air, and nutrients. exiGrow safely solubilizes these minerals making them available for uptake by the plants and opening up the soil. If you've ever made a volcano for your child's school project and poured vinegar over baking soda, you've seen a similar chemical reaction. Does exiGrow use hydrogen peroxide, vinegar, or citric acid? No. Acids like hydrogen peroxide, vinegar, and citric acid will have a similar reaction with the alkalinity in your soil. However, at low pH, these acids will also kill your plants and are dangerous to you and your pets, and at higher pH, they won’t be effective. The exiGrow primary active ingredient is a patented acid replacement that has the power of 0pH but is 100% safe for you and your plants--even at the full concentrate. exiGrow also includes natural wetting agents and surfactants that help to spread the solution and water through the soil. Since 2006, growers and professional groundskeepers have been using the solution since nothing is more powerful and safe at dissolving hardened mineral salts blocking your soil. What golf courses use exiGrow? Some of the golf courses that have been using the commercial version, called Eximo, since about 2006, include: Riverside, Soldier Hollow, Wasatch, Promontory Ranch, Sleepy Hollow, South Mountain, Smyrna, Wildfire, Phoenixville, Rolling Hills, Overbrook, Seminole, The Legends, Valhalla, Haulalai, and Seminole. In fact, the PGA-owned Valhalla Golf Club in Kentucky, also instructs superintendents of other golf courses to use Eximo as part of their golf course management program. How can so little exiGrow cover so much area? At the 1oz setting, each ounce of concentrate should cover up to 500 sqft (a 32oz bottle will treat up to 16,000 sqft). We recommend two applications in the first month in consecutive weeks followed by about monthly applications during your growing season as needed. When would I apply your product on tall fescue? Each time I fertilize? How much you should use depends on the condition of your soil, i.e., the extent of compaction due to the hardened minerals or clay. Generally, we recommend treating the soil at least once each month during your growing season. Your first application and/or during the driest period of summer, you may want to do a double dose. Are there third-party reviews anywhere? I googled you and nothing came up. The exiGrow solution has been available commercially for about 15 years, but we’ve just begun to offer it for home use. You should find information about the commercial version called Eximo. Does exiGrow replace the need to lime, and does it include a surfactant? exiGrow uses the same formulation as Eximo and can replace lime and other acid soil treatments. The solution is based on a patented acid replacement technology that gives you the low pH benefits without the harmful effects, e.g., corrosiveness. Farmers use the solution around the base of their fruit trees in the orchard and other crops instead of sulphuric acid since the exiGrow solution won’t harm the plants. exiGrow also includes a natural wetting agent to help spread it and water and nutrients through the soil. Ok it worked! FB has a lot of critics as you can see. Things that are new to people they tend to post doubting messages. I did half my lawn which is clay based soil under thin layer of top soil. I hit it every year with gypsum with the hopes of breaking up the clay. So your product works but it’s not an instant overnight change which I think most people are thinking. Didn’t know how this was going to work or if it would work for my lawn but it did. We had a brutal summer with temperatures at 100 degrees or near that for weeks and I was having to water almost everyday. My lawn was taking it on the chin from the heat as well as the pocket book and water trying to get into hard, clay soil that runs through my yard. I saw your ad and thought, why not give it a try. I am so glad I did and I have recommended your product to my son and want to use this at my second home as well since my lawn came alive and I was able to cut back the watering to 3 times a week and the grass is so green, neighbors have commented on how nice it looks. — Jim & Valerie B. For discount pricing on exiGrow in larger volumes, please contact us at sales@truSpring.com. Thank you.